Blackburn Rovers have signed former Coventry striker Jay Bothroyd on a season-long loan with a view to a permanent deal. Bothroyd, 22, who was the only Englishman playing in Serie A last season, joined Perugia in 2003. Graeme Souness told the club's website: "He's a young player we've been aware of for quite a while. "He has scored goals in Serie A and it's a hard league to score in. We hope to bring out the best in him." 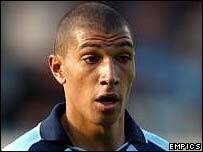 Bothroyd signed a three-year contract with Perugia in July 2003 after being released by Coventry City. The Italian club will be playing in Serie B this season after losing a promotion play-off to Fiorentina. He joined Coventry in a £1m deal from Arsenal, where he failed to become a first-team regular under manager Arsene Wenger.